Once – Better Than A 10! Following chef Ricardo Zarate, one of my favorite Los Angeles chefs, has been an exhilarating culinary adventure. 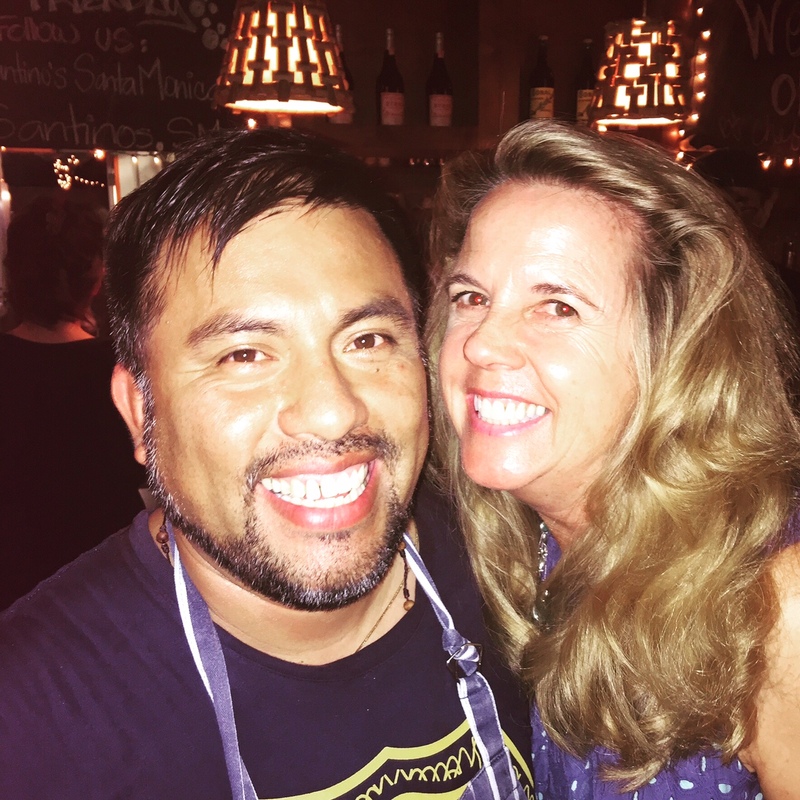 I first met the three-time James Beard Foundation award nominee at his spirited, urban Peruvian restaurant, Mo-Chica. He followed that success by opening Picca, near Century City, and Paiche, in Marina del Rey, introducing pleasing South American cuisine with a touch of Asian and European flavors. I also followed him to Santa Barbara to experience his Blue Tavern restaurant, featuring Californian cuisine with a Peruvian flair in hand-tossed pizzas, pasta and grilled meats. Sadly, it all came to an end when he disappeared from the L.A. restaurant scene. While dining at different restaurants in Los Angeles, I recognized a few of his loyal servers and whispered, “Where is Ricardo Zarate?” Quietly, a few told me, “He is coming back, and he will make a sensation when he does.” I held onto those words. Last month, I learned Zarate is back. He opened a pop-up in Santa Monica at Santino’s on Lincoln Boulevard. Many of his previous employees wanted to work with the kind and gentle chef again, especially his Paiche crew. Naming his new pop-up Once (pronounced on-seh) made perfect sense, since in Spanish it means number 11, and Zarate is the 11th of 12 children in his family. Growing up in Lima, he was in charge of cooking for his family at a young age. I eagerly made a reservation to reunite with my old friend and experience his new venture. The interior of Santino’s is dark, with lots of wood and light fixtures with designs made from wine corks. I sat at a table for two and noticed the pleasing scent of grilled vegetables and meats. Zarate’s son was assisting him at the grill. The tables are close together letting guests see the different dishes being delivered in the dining room. Feisser Stone, known as a superstar mixologist at Hinoki and the Bird helms the bar at the back of the restaurant. Guests may order beer, wine and low-proof cocktails including the Mint To Be made with sherry, lime, cucumber and garnished with mint. It was very refreshing on a warm summer night. I also ordered a Passion Fruit Brut made with champagne, aperol and a small passion fruit popsicle. The bubbles of the brut slowly melted the popsicle. 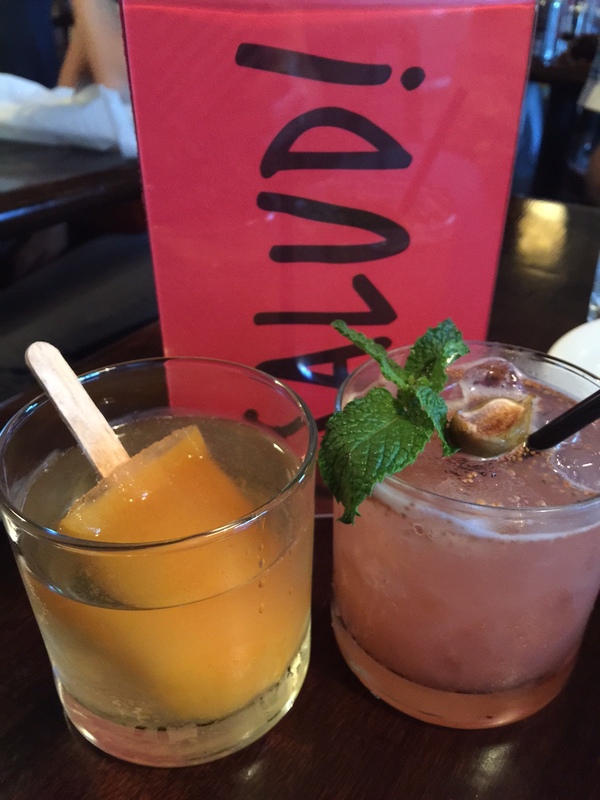 The menu features 11 a la carte dishes that change weekly based on ingredients Zarate finds at farmers’ markets. His goal is to create dishes that people are eager to share with others at their table. 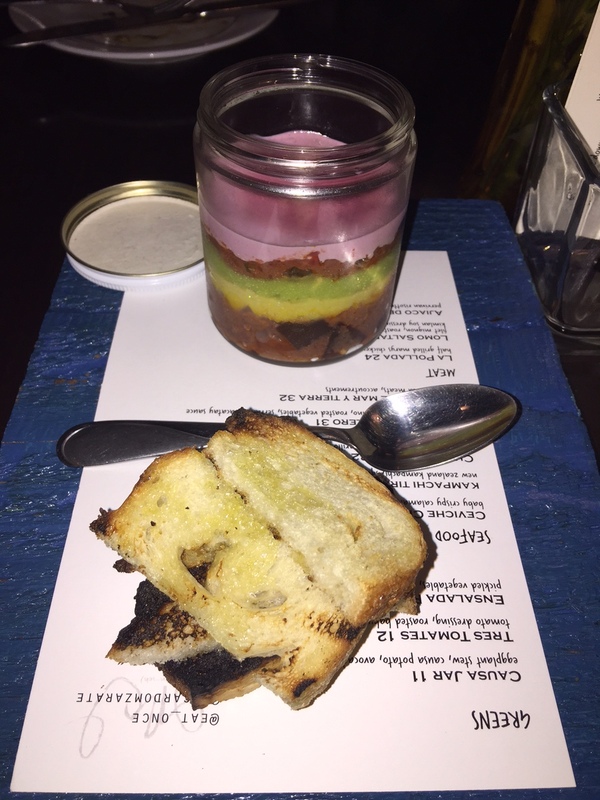 My favorite starter was the Peruvian causa in a mason jar. Causa is a popular layered Peruvian potato dish served cold. Zarate starts with a base of Peruvian black botija olive aioli, layers it with smooth avocado and mashed yellow potatoes, and tops it with a beautiful, thick, eggplant stew with pieces of the dark purple skin. It’s served with thinly sliced grilled bread brushed with oil. Causa has the consistency of budino, and is an exquisite spread on the toasted bread. We were also thrilled with the smoky barbecued figs paired brilliantly with peppery arugula and crisp pepitas dusted with Parmesan. The dish was drizzled with savory balsamic rocoto chile pepper dressing. Zarate offers seafood dishes including one of his famous ceviches, which are packed with heat. Paella is grilled on the back patio, and charcuterie plates include octopus and cured meats. After a plate of deep-fried, crispy Japanese mackerel sprinkled with sea salt arrived, I passed the plate to an inquisitive man at a nearby table. 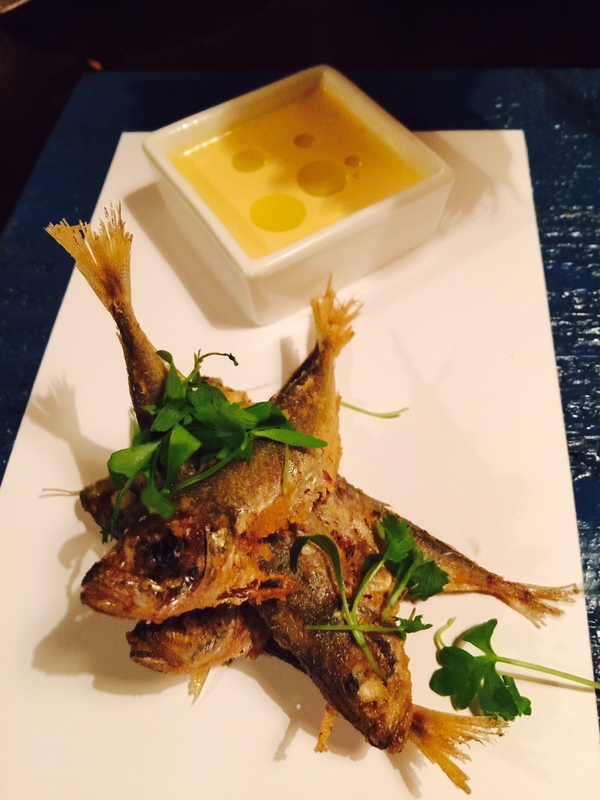 He closed his eyes and smiled after he tasted the crispy fish dipped in a lovely citrus aioli. When Zarate’s wood fire-grilled Peruvian paella was brought to his table in a large, black skillet, the guest urged me to try the fried rice mixed with amarillo aioli, black tiger prawns, juicy and sweet Hokkaido scallops and Chinese lachang sausage. Three meat options on the menu include a small rib-eye plate and a much larger rib-eye dish served with cipollini onions and grilled tomatoes. We ordered the filet mignon sliced and served in a black skillet with roasted tomatoes, braised cipollini onions, red onions, grilled green onions and sliced fingerling potatoes. Zarate uses Kimlan soy dressing to make savory gravy, and serves a sunny-side-up egg on top, making the dish spectacular. Zarate also offers three desserts each week including panna cotta, and chocolate and picarones. We ordered the chocolate mousse with lucuma – a Peruvian fruit with maple and sweet potato flavors – and topped with Chantilly cream. The couple seated next to us loved the sweet potato beignets served with a cup of fig syrup. Glasses of sherry, vermouth, Moscato D’Asti, Cardamaro, Bonal and Byrhh – an aromatized apéritif made of red wine – are available for guests craving after-dinner drinks. Zarate twice walked into the dining room to greet some of his familiar guests. A few diners stood up to shake his hand and pat him on the back. I rose to give him an appreciative hug and congratulated him on his new endeavor. Zarate is back and better than ever. Reservations are available Thursday through Saturday from 5 to 10 p.m. until October for tables for two, four or six guests. Reservations can be made up to two weeks in advance by visiting https://www.table8.com/v/once-by-ricardo-zarate. A limited number of tables are available on a first come, first served basis. If seats are available at the bar, walk-in guests are welcome to sit and watch Zarate do what he does best – cook amazing Peruvian plates. 3021 Lincoln Blvd., Santa Monica. http://www.eatonce.com. This article was featured in the Beverly Press and Park LaBrea News on September 10, 2015.